Now you can Fly Fish with Your Spinning Rod & Reel! Now you can catch fish after fish with a fly and bubble — and be the envy of everyone on the water! At Best Fishing Secrets, we have assembled the perfect fly and bubble casting rig. It includes the toughest casting bubble available, a high-quality tapered leader, two Universal Flies™, a brass swivel and even easy-to-understand instructions showing the knots you’ll need and suggestions on how to cast and retrieve. 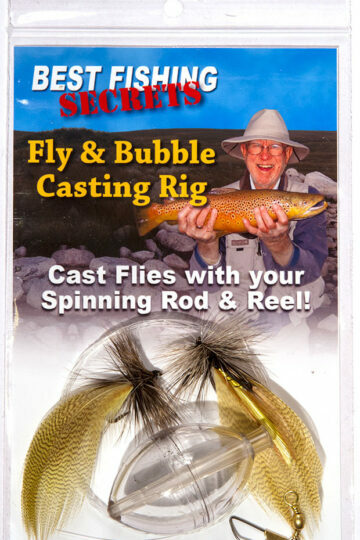 This package contains everything you need to successfully cast flies with the spinning rod and reel you already own. The patented Universal Flies have proven to be very effective on many species of sport fish. So rig up, cast, and get ready for the best fishing of your life. Whether you’re fishing big rivers, small rivers or lakes — and if you like floating or sinking your flies — the Fly & Bubble Casting Rig, with the Universal Fly will quickly become your fishing tackle of choice. Fly fishing with spinning rod & reel has never been more fun, whether you’ve got tons of experience or taking the kids on a trip they’ll never forget! Check Out the Fly & Bubble Casting Rig, the Universal Fly, Tapered Leaders and our Casting Bubbles. Here’s a quick video of us fishing trout and catching some huge browns…and there are more videos on the Secrets page!